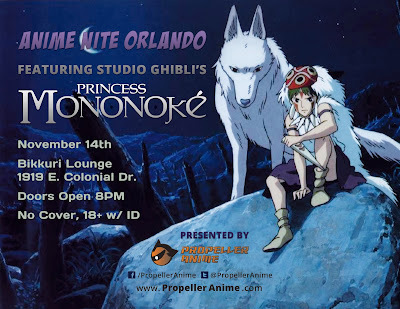 The first Anime Nite Orlando of Propeller Anime's EIGHTH year will be Thursday, November 14th at Bikkuri Lounge, located at 1919 E. Colonial Dr. Orlando, FL! It will be a night of great friends, delicious Japanese cuisine, and some of the best anime ever! We are excited to kick off the next year of anime showings with a bang featuring a movie we have never shown before in out entire history. Directed by the legendary Hayao Miyazaki, our headliner will be Studio Ghibli's Princess Mononoke! Princess Mononoke is the movie that brought international mainstream attention to both Hayao Miyazaki and Studio Ghibli. 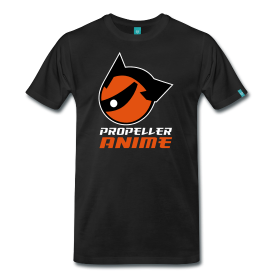 It also helped anime gain a lot of appreciation in the United States as a legitimate form of story telling during the start of the anime boom that closed out the nineties. If you haven't seen this movie, you are in for a fantastic treat. Even if you have, come out and see this tremendous film with a lounge filled with passionate fans of anime. Before Princess Mononoke, we'll be opening up with a critically acclaimed anime that will greatly compliment the movie with Mushishi. 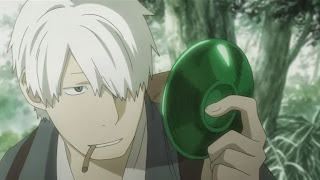 In the past, Mushishi has won grand prizes for best television series and best art direction from the Tokyo International Anime Fair. But that's not all! If you haven't been to Anime Nite Orlando before, know that Bikkuri Lounge has a bar that serves the finest in beer, sake, and liquor drinks! On top of that, the restaurant across the hall has a full menu of delicious Japanese dinner and even boba tea! We'll have prizes to raffle as well! 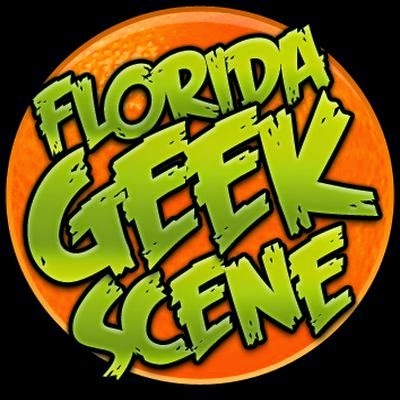 Some cool items were picked up at the Orlando Japan Festival and now you will have the chance to win them just by showing up! Doors open at 8pm. The event is free and you must be at least 18 years of age with valid I.D. to get in! We hope to see you because a lot of fun is going to be had!